Hillbarn Theatre Company’s latest offering is A Little Night Music which opened on Friday, 10 May. This highly acclaimed Stephen Sondheim and Hugh Wheeler musical, suggested by the Ingmar Bergman film Smiles of a Summer Night, follows the lives and loves of several mismatched couples in early 20th Century Sweden. As Sondheim recalls in his memoir Finishing the Hat, director Harold Prince once described A Little Night Music as “whipped cream with knives.” An apt description as the plotline is both sweet and sharp. Sondheim claims he focused on the knives and spent his energy pursuing his dream of writing a “Theme and Variations,” in this case, using a metric theme, or more specifically a triple-meter theme exploring the myriad options available to him beyond the waltz. 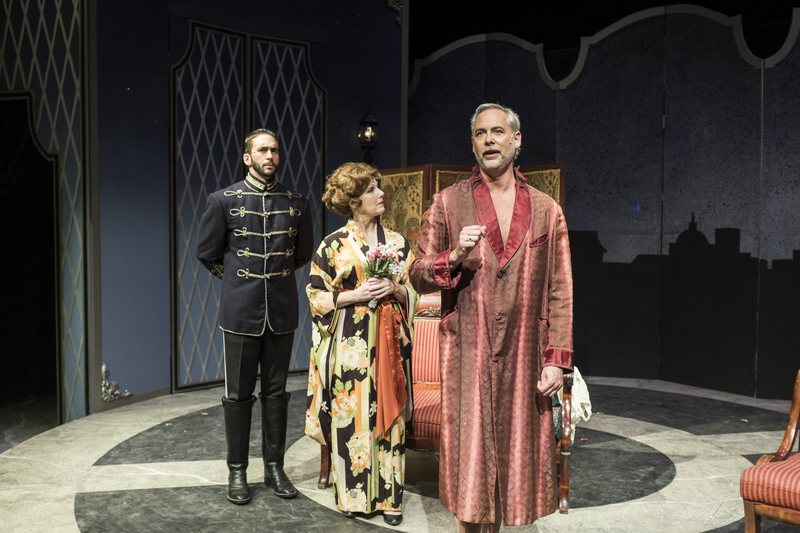 Director Dennis Lickteig ably tackles a big show in a small space, and through his sometimes out-of-the-box thinking, presents some inspired staging aided nicely by Robert Broadfoot’s scenic design. A stunning example is Act 2’s dinner scene. There’s no grand dining table in evidence, but it’s not missed as the action captivates the audience. Broadfoot’s three-walled set covers the bulk of the stage with hallways allowing for down stage entrances from both sides, and large doors built into the sides of the corridors provide ample space for easily moving furniture on and off. While the script calls for a large reveal at the end of Act 1 setting the scene for Act 2’s country estate location, we don’t see that unfold until intermission when the upstage townscape is replaced by the door to the estate, and large trees replace the lamp posts in the upstage corners. The plot is somewhat convoluted and retains the melancholy tone indicative of Bergman’s works, but a partial scorecard seems in order. Fredrik Egerman (Cameron Weston) is a lawyer recently married to Anne (Nicolette Norgaard), a mere girl of 18, two years younger than his son Henrik (Jack Mosbacher). Henrik is a frustrated, seminary student. Petra (Sarah Griner) is Anne’s maid and confidant. Fredrik’s former lover is Desiree Armfeldt (Lee Ann Payne), a prominent actress and Fredrika’s (Leah Kalish) mother. Desiree’s mother is Madame Armfeldt (Christine Macomber), and she’s “rescued” Fredrika from Desiree’s negative influence. Count Carl-Magnus Malcolm (William Giammona) is Desiree’s current lover, and his wife, Countess Charlotte Malcolm (Alicia Teeter), is put upon trying to win back his heart. Charlotte is also the older sister of a school friend of Anne’s. Lickteig harkens back to the original opening, presenting it through Fredrika’s eyes. A vocal quintet (Tabitha Tetreault, John Rinaldi, Mark Enea, Stephanie Case, and Maria Mikheyenko) is scripted to be a Greek chorus, and Lickteig introduces them circling Fredrika while she looks on in wonder as they sing a vocal overture. As the number continues, the rest of the company enters waltzing with their partners, but then they switch and the pairings are mixed up setting the scene for the drama and humor to come. The quintet has a lovely presence dressed in formal evening attire, but there are some problems musically. While most of the sustained passages work fairly well, some of the moving parts are pitchy and slightly off rhythmically. They also have some difficulty with quickly interspersed lyrics such as in Act 2’s Night Waltz when some of the lines are dropped. Life and love aren’t always straight forward, and after the opening sequence, the Egermans vent their sexual frustrations through their lyrics and actions. First Fredrik sings his rant opposite Anne’s jabbering. Next Henrik sings his lament, and finally Anne sings hers. A trio then follows, combining all three perspectives. Mosbacher and Norgaard are strong and blend well vocally, but Weston is tentative, and his part gets lost in the shuffle. Weston is hesitant and too calm through much of Act 1, not really connecting with either Mosbacher or Norgaard. He’s better later in the show and has some very nice scenes with both Payne and Giammona. It Would Have Been Wonderful is sung faster than written, but it works well with more energy and verve conveying both Fredrik’s and Carl-Magnus’ perspectives. Mosbacher is solid as Henrik. His frustration at his life’s choice comes through, as does his gentleness and vulnerability making his one explosive Act 2 moment all the more poignant. He also wrestles nicely with a cello on stage. He doesn’t actually play it, but he fakes it convincingly, and his final pluck is well-timed. Unfortunately, Lickteig’s staging choice with Henrik’s cello misses a critical metaphor to hammer home his discontent. Norgaard is impressive. She’s only 16, and she’s convincingly playing an 18 year-old. Her voice is solid, and her acting is on target. She connects tenderly with Mosbacher, and works well with Teeter. Teeter plays an understated Countess, and this gives her character more impact. Teeter and Norgaard’s Every Day a Little Death is wonderfully chilling and enlightening. Desiree Armfeldt fits Payne like a glove, and she shines in her portrayal. Payne doesn’t burst onto the scene as a show stopping diva; she plays the role with finesse, with heart, and with well-timed jabs both at herself and her lovers. She makes everyone opposite her look good, but she has some particularly nice moments with Kalish amidst the chaos surrounding them as they freeze frame and observe. Payne’s Send in the Clowns is heart-wrenching, both in her solo and in the reprise with Weston. Griner has her moment to shine as well. She’s sassy and bold, flirting with Henrik, but her big moment comes late in Act 2 when she sings The Miller’s Son beautifully after her literal roll in the hay. Probably the best number in the show is the Act 1 finale, A Weekend in the Country. Written as a mini-operetta, each member of the company has a stake and a different perspective on the event as a subplot unfolds. Musical director Greg Sudmeier’s orchestra is sequestered back in the shop behind the stage and is fed the house mix. The instrumental blend with the actors is quite good, and aside from a few small misses opening night, these musicians are on top of their game. It’s an interesting choice keeping woodwinds, strings, keyboards, and percussion for performance. The classically infused score works well with this aurally colorful combination, but there are a few moments, mostly in the more rambunctious or martial segments, when the brass parts are missed. The positives far exceed the negatives in Hillbarn’s A Little Night Music. There’s also far more humor mixed with a bittersweet tone embedded in the script than the cast recording alone may indicate. On the surface, there is “whipped cream”, but as you dig deeper, you hit the finely honed blade. When: Continues through 2 June 2013. See http://hillbarntheatre.org/a-little-night-music/ for more information or to order tickets.